I have a question, is there a way to control how many persons & organization profiles can be created for 1 member/user account. It appears that a user can create multiple persons & organization profile under one account. For accounts, you can put a limit on them by going to Studio > Settings > Accounts and changing 'Limit number of profiles (0 - no limit) ' to whatever you want. I am not sure if this applies to Orgs though. Yes Chris, but did you know that if one creates an account, they can also clock on their profile pic on upper right corner > scroll down > choose create a new profile and boom!! They can create multiple profiles. The template is Decorous, but I'm pretty sure a user can create a new profile on other templates as well. They can also create multiple orgs as well. Yes Will the template has nothing to do, but if you allow only 1 account, I mean Limit of the number of profiles (0 - no limit) = 1 you can not create, even if you click on profile, the page is empty. But with Limit of the number of profiles (0 - without limit) = 1 you can not create a second one. So I think it works properly. I specify that I do not have Org installed, but I guess he does not change anything. Well i just attempted to create a new profile using a test account and what i was able to discover is that the user can create multiple accounts, but after creation they can't perform any actions on the site. However they can upload a profile picture and that scam profile will be added on the "new people block." I don't think that should even be allowed, cause then they can create god knows how many profiles will be floating around. Don't you think? Not good that a notification is then provided to users friends etc.....people will catch on and then start creating profiles by the dozens. Yes Baloo, i did those changes but if create profile is disabled, then people can not join ? Not disable, limited to 1 in permission. Not confirmed 1, standard 2, I think you can secure like that. If it's like home, when you save there is a drink, but it is still recorded, can you confirm this bug? NB: It is better in any case to limit to a reasonable number all the actions add by indicating this time a counter. For example, 25 per hour. So that while you sleep, a spammer can not flood the site, it is better to prevent than cure. Up: depends on actions, for videos better put 10 for 24 hours for example. Re-up: It is also a good way to limit spam by email, in dolphin there was a security of 60 seconds between two messages, here nothing, so pay attention to that, impose a maximum limit per hour. Will Monte it isn't quite clear what is your problem, please specify if you tried solution suggested by Baloo and Chris ? Limiting this via permissions asn't advisable since after profile deletion user will not be able to create new one, also there is some other logic associated with it like hiding some links and something else. I just created another profile following Baloo and Chris suggestion, although once additional profiles are created, no actions are allowed using that profile. Alex this is done after original account is created. In other words let's say here in UNA, i under my account Will, i can create multiple profiles, but i can't perform any functions in UNA. But the profile is created. That's ok, no worries, yes look at photo i did. Which one ? 1, 2, 3, 4 ? Will, you are editing a block. The setting is in studio, not a block. Follow the path we shown you. Yes, i was in permissions, i think i need an eye doctor... i entered "1" now it does not allow, thank u guys! It appears now that i have taken away the ability from admin account to create a profile and organizations. Good in this system, there is still something that escapes me, in which circumstance a member might want to create two different profiles? An organization or even several, yes, plausible but a second person profile I do not quite understand the benefit. Sincerely, it's very complicated things for little benefit ... or there are cases that I can not imagine, please explain me. Sure, if i disable "create organization in permission" for a specific membership, it will apply that action to other levels. Seems that replies from this thread https://una.io/page/view-discussion?id=115 are good to this one. Sure and please Alex, Admin and Operator to have their own settings to create profiles and organizations. Yes, this is what above ticket is for. Seems to me that this is yet another admin design flaw that is confusing. It stated at the top, Edit create person's profile action. LOL. So, what does that one do? 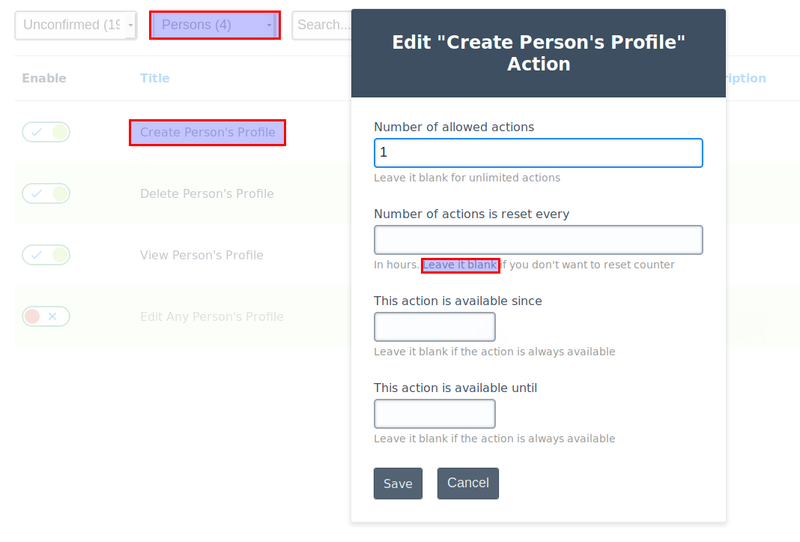 This action regulates the possibility to create person's profile for the different permissions level. As other permissions actions. But I suspect that you know it and your question has a double bottom? This is another major HUGE problem that has not been resolved.